“Alpen: Nördliche Flysch- und Kalkalpen” by G. Neugebauer, TU München, 1969, original scale 1:25,000. In 1969, G. Neugebauer of the Technical University of Munich (Germany) published an interesting map of a part of Allgäu, Germany. The map shows a peak in a Flysch area, flanked by sharply eroded limestone terrain. 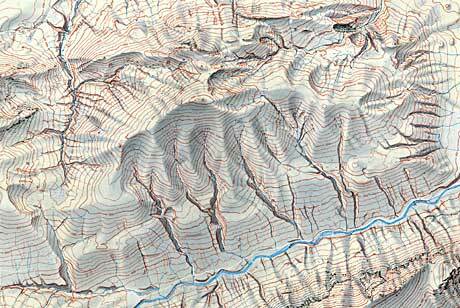 Neugebauer accentuated the small details – the gullies cut by small streams. The main mountain ridges are therefore not easily recognizable at first sight. However, his goal was probably not to emphasize the primary landforms, but to depict the geomorphologically interesting smaller features.